They successfully developed an injectable form of birth control known as immunocontraception. Today, this has been refined into a single injection that lasts for at least two years, can be administered from a short distance using a dart gun, is safe for the environment, and has no side effects on the deer....And yet the tragedy is that it's not being used....IDA envisions the day when contraception for deer and other wildlife is the norm, and we know it can be done. It just takes persistence and a refusal to surrender to the forces which always see killing as the answer. Your gift to this pioneering and life-saving project can make it happen. I get very angry that killing animals is often the first "solution" to resolving clashes between them and the human population. This is especially frustrating when there is a readily-available solution that does not harm animals but gets the desired outcome. That's why IDA's efforts to support proven birth-control for deer are so important to counter plans by communities that want to cruelly kill them. We have an exciting opportunity - right now - to help fund a deer contraception project that could pave the way for many other communities to follow. But we need your support right away to raise $15,000 to make it happen. I remember the first time I saw a deer in my backyard. It was four years ago, and the experience was magical. I felt transported to a more perfect world, one I had only heard about, but never witnessed first-hand. The beauty and grace of this peaceful deer was simply breathtaking, and I felt so privileged to behold her standing so close to me. I was shocked to learn that some people, right here in my community, were angered by the deer and were eager to see them eliminated - by any means possible. Fortunately, not everybody felt that way. Many shared my joy over the deer, but a few – a very vocal few – wanted all the deer killed. I soon learned that what I saw in my community was happening all over the country. With increasing human expansion and loss of habitat, deer were forced to move into new areas – squeezed out of the forest they could no longer inhabit. In typical fashion, the knee-jerk response from government officials was to kill, kill, kill. While hunters readied their guns, eager to take aim at this new target, government officials shook their heads, realizing you cannot use firearms where homes are packed together side by side, and where killing fields may be just yards away from a playground full of children. Enter the new world of "suburban hunting," in which the challenge is to use weapons that will kill the deer but not the people around them. 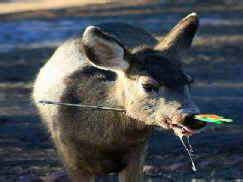 State wildlife agencies champion bow hunting as a "safe" alternative to guns for suburban areas – using barbaric arrows to kill deer – a cruel and slow method that almost never results in immediate death or unconsciousness. IDA was contacted about many horror stories, including one deer in Ohio, seen with an arrow in her eye for months before she died of infection. The killers also borrowed a slaughterhouse method – the captive bolt – in which a metal stake is driven into the deer's brain – if you can strike the deer correctly. Because the deer are not penned in, they have to first trap them, struggling, under a net, to make them easier targets. But the nets won't stop panicked deer from thrashing in their desperate attempts to survive the assault. There's a way out of this grim scenario, and together we can make it happen. Click here to become part of the solution. Scientists predicted rising populations and loss of habitat for deer decades ago, and began studying safe and effective ways to reduce their numbers in urban environments. They successfully developed an injectable form of birth control known as immunocontraception. Today, this has been refined into a single injection that lasts for at least two years, can be administered from a short distance using a dart gun, is safe for the environment, and has no side effects on the deer. And yet the tragedy is that it's not being used. Resistance to change, fueled by pressure from hunting groups and the hefty revenues that go to state wildlife agencies from the sale of hunting licenses, all stack up to keep deer contraception from being widely used. That's the frustrating reality. But now, with your help, we have a real opportunity to change that. IDA is working with one community in New York to use contraception in place of killing. It hasn't been a quick or easy process – there were many obstacles to overcome – but we stuck with it, and I'm happy to tell you that these deer - originally destined to be killed using the terrible netting and bolting method - may now be the beneficiaries of one of the first community-driven initiatives to use immunocontraception in place of the slaughter. Unfortunately it's expensive, and we need support from people who care about the deer and will not stand by quietly and see them slaughtered. Immunocontraception by itself is not costly. One injection costs about $75. But because it's not a standardized method, we have to comply with state requirements to carry out a research study that imposes additional costs. We need to raise $15,000 right away to eliminate the threat that these deer may be heartlessly killed during the coming fall/winter season. Past support from you and many other caring people make us hopeful. The alternative is unthinkable. This is not about just one community of deer. We will open the door to the use of birth control instead of killing everywhere. We can save so many lives with the work we do now. 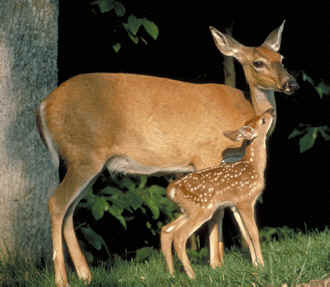 The deer need us - all of us - standing together to protect them from those who want them eliminated by brutal means. IDA envisions the day when contraception for deer and other wildlife is the norm, and we know it can be done. It just takes persistence and a refusal to surrender to the forces which always see killing as the answer. Your gift to this pioneering and life-saving project can make it happen.